A Love Greeting Card that Suits Any Occasion? How Cool Is That? Usually, when making a love greeting card for an occasion, the theme of that occasion goes on the card. However, this unique love greeting card has no special event theme. Yet it’s great just by itself. Apart from this, it still works even if you include other cards for other celebrations like valentine, birthday, anniversary, or anything you throw at it. Bottom line: the card is versatile. But this is not the only thing that makes it unique. Click here to see another reason why this is a unique card. Score the 8.5” x 11” black cardstock right in the middle and fold it into a 5.5” x 8.5” cardstock paper. Use spray adhesive on the back side of the lace material. To avoid spray adhesive from getting everywhere, place the lace in a box and spray into the box. The sides of the box will catch the excess adhesives. Place the folded black cardstock on the sprayed lace material. It’s usually easier to do this while the cloth is still in the spray box. Next, properly cover the whole black cardstock with the lace material and allow glue to dry. Trim the edges by cutting off the excess cloth from the card. 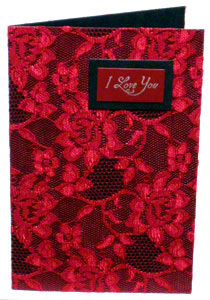 Use the silver ink pad and rubber stamps to print “I Love You” on the 1” x 2” maroon cardstock paper. Glue this maroon cardstock on the 1.5” x 2.5” black cardstock paper. Finally, glue this black cardstock on the lace card ⅞” from the top and ⅞” from the right. That’s the last step. The only decision left to make is whether you will use this I love you greeting card by itself or for a specific occasion. Don't have spray adhesive? You can properly wrap the cardstock with the lace and hold it down in place inside the card with tape. Then, score and fold another cardstock paper (about 7.5” x 10”). And glue it in place in the middle of the card to cover the tape. This will add a little thickness to the love card. However, it is still awesome and worth it.